The 2016-2020 Leadership Council, from left: Sisters Mary Jo Thummel, Jean Rosemarynoski (president), Therese Blecha (vice president), Marilyn Wall and Janet Lander. 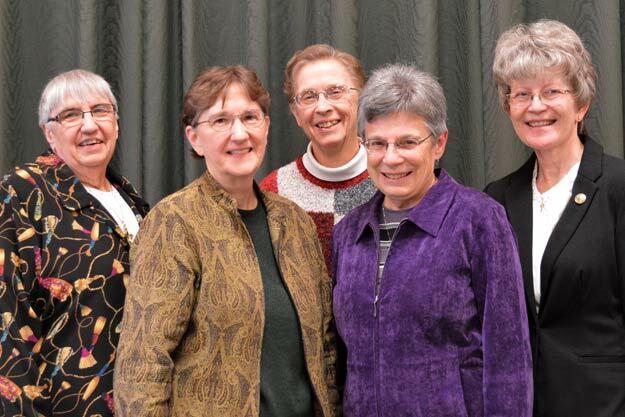 The five-member Leadership Council of the Sisters of St. Joseph of Concordia began its term July 1, 2016, and will hold office until July 2020. • Sister Jean Rosemarynoski serves as president. She grew up in Wichita and Topeka and also serves as development director for the congregation. She was most recently vice president of the congregation (2012-16) and prior to that served four years as a council member (2008-12). • Sister Therese Blecha, who grew up in rural Republic County, serves as vice president. Until being elected to the Council in 2012, she served as the congregation’s treasurer and taught at Cloud County Community College. This is her first term as vice president. • Sister Mary Jo Thummel is a native of Plainville, Kan., and was most recently a pastoral associate at St. Francis Xavier Parish in Junction City, Kan. This is her second term as a council member. • Sister Marilyn Wall is originally from Aurora, Ill. Before her election to the council, she lived Washington, Kan., where she was pastoral associate, secretary for the Washington County Ministerial Association and a chaplain with Meadowlark Hospice. This is her first term as a council member. • Sister Janet Lander, originally from Santa Monica, Calif., lives at Manna House of Prayer in Concordia, where she has served as a spiritual director and retreat leader. This is her first term as a council member.